Small BooBooLoon inflatable protective pet recovery collars fit pet neck sizes 8” to 12” (20cm to 30cm). 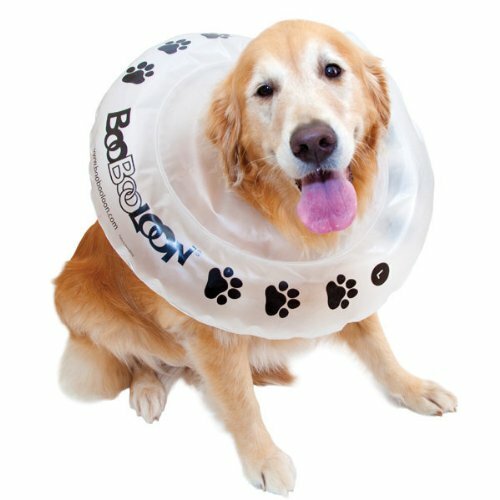 The comfy BooBooLoon inflatable collar forms a soft, flexible cushion around your pet's neck to comfortably restrict dogs and cats from harming most post surgical wounds, injuries and irritating skin disorders. This easy to use and comfy recovery collar provides protection, comfort and allows your pet to eat, drink, sleep and move normally. 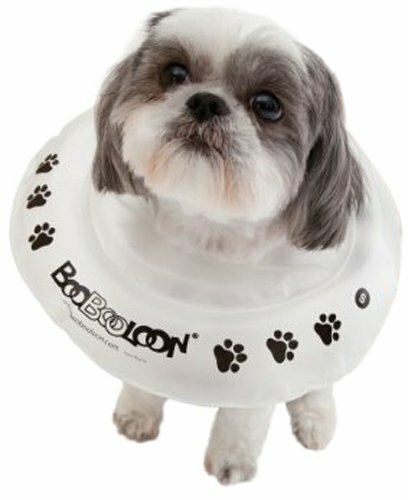 Just at a time when your pet isn't feeling too great, the BooBooLoon inflatable protective pet recovery collar is a humane alternative to hard, rigid Elizabethan cones and uncomfortable collars of the past. Your pet will enjoy complete freedom of sight and movement while being comfortably restricted from harming most wounds and skin disorders. Proper inflation is an important element of this product. Save your Breath! A less than fully inflated recovery collar will be soft, flexible and more comfy for your pet. The Velcro type coins should lay flat for a tight grip, ensuring the BooBooLoon will not come undone or risk puncture. 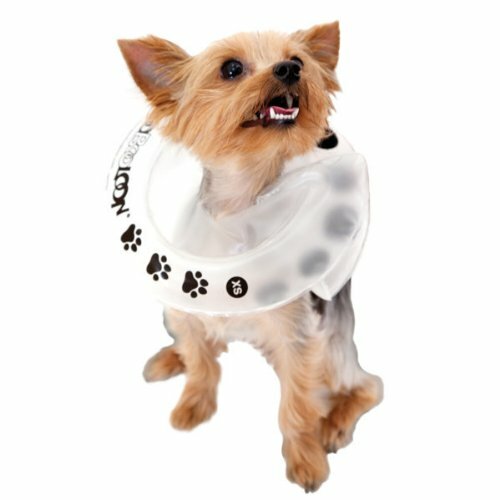 Inflatable Pet Recovery Collar Features: -Available in Extra Small, Small, Medium, Large and Extra Large pet collar sizes. -Smaller sizes are also suitable for cats. -Made from a soft pillow-like, yet durable material. -Easily inflates. -Fully adjustable using hook and loop Velcro type fasteners to ensure a snug and comfortable fit for your pet. -Flexible and soft inflatable collar will not damage your home or furniture. -Washable and easy to use. If your pet is between sizes, or has longer legs ordering the next larger size is recommended. Reducing collar inflation may increase adjustability and comfort for some pets, but never blow up your pet's BooBooLoon inflatable collar more than half way. BooBooLoon recommends trimming and filing claws before use with cats.